The Japanese art includes a wide range of styles and means of expression, including ceramics, sculpture, painting and calligraphy on silk and paper, the ukiyo-e woodblock prints, origami and, more recently, manga along with a myriad of other types of artwork. It has a long history as much as the culture of the country of the Rising Sun, which starts from the beginning of human settlements, in about 10,000 BC, to the present. Historically, Japan has been subject to sudden invasions of new and alien ideas (it's appropriate to say, as for its geographical and cultural characteristics the country has almost always been a "world unto itself") followed by long periods of contacts minimized with the outside world. Over time the Japanese have developed the ability to absorb, imitate, and finally assimilate those elements of foreign culture that complemented their aesthetic preferences. The first examples of complex art in Japan was produced in the centuries VII and VIII in connection with Buddhism. In the ninth century, when the Japanese began to free itself from the cultural influence of China and develop indigenous forms of expression, the secular arts became increasingly important. Until the end of the fifteenth century, both religious and secular art had flourished. After the Onin War (1467 - 1477), Japan entered a period of political disintegration, social and economic, which lasted for over a century. In the state organization that emerged under the leadership of the Tokugawa shogunate, organized religion began to play a much less important role in people's lives, and the arts that survived were primarily of a secular expression. The painting, practiced by amateur and professional, is the preferred artistic expression in Japan. Even today, as in ancient times, the Japanese wrote with a brush rather than a pen, and their familiarity with the use of the brush techniques has made them particularly sensitive to the aesthetic values of painting. With the rise of popular culture in the Edo period, the style of ukiyo-e woodblock prints became an important art form and its techniques were refined to produce colorful prints of practically every topic, from daily news to the issues of school books. The Japanese have always thought that the sculpture was a means much less empathetic of artistic expression: the use of sculpture in Japan has almost always been the prerogative of religion and its use has waned along with the diminishing importance of traditional Buddhism. The ceramics, among the best in the world, represent the first known artifacts of Japanese culture. In architecture, the Japanese have always expressed clearly their ancestral preference for natural materials and for the harmonic interaction between the interior and exterior space. 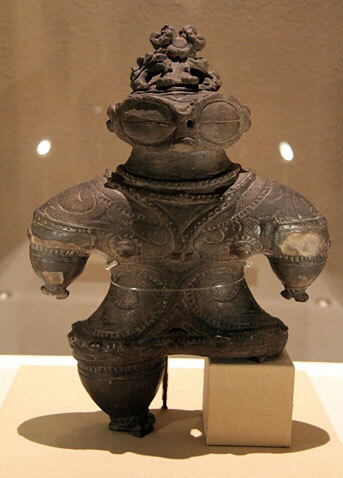 Jomon (縄文時代) from origins to about 300 B.C. The period takes its name from the "string texture" with which were decorated the first ceramic artifacts and includes the first artistic testimonies of Japanese proto. Yayoi (弥生時代) from 300 B.C. to about 300 A.D. The artistic production is aesthetically simple but begins to contemplate the use of revolutionary technologies such as the lathe. A fundamental characteristic is the introduction of metallurgy. It is the period marked by the supremacy of the eponymous clan who was the first to unify the country. The distinctive architectural feature is the building of rich and impressive burial mounds. For the first time there is a fixed capital for the empire: Nara. Previously, in fact, it ranged when the Emperor died. Decisive the influence of Buddhism in artistic production. Flourishes the production of mandala, and of the first pagodas. The court began to develop great attention to the arts. By this time the famous Genji monogatari. It takes its name from the shogunate during which we are witnessing the shift of power from the aristocracy to the military samurai class. In art prevails realism. After the interlude of the city of Kamakura, the imperial capital back to being Kyoto. The artists take up less popular and aristocratic themes. Decisive influence of Zen. Azuchi and Momoyama are the respective castles of both Nobunaga and Hideyoshi daimyo whose series of wars characterizes the period. It affirms the Kano school of art. It is the triumph of political and military power of the Tokugawa who moved the capital to Tokyo and closed all the doors to contacts with foreigners. Great attention given to science and techniques. The renewal Meiji return power to the emperor after centuries of rule of the shogun. The country, as a result of a strong impetus of industrialization, become a military power. It is a phase of democratization. The emperor's weakness allows, despite the imperialist tendencies in the war years, the affirmation of a widespread cultural liberalism. With the long reign of Emperor Hirohito the country lives immense social and cultural upheavals determined by both the World War II and the post-conflict reconstruction. With the rise to power of Akihito, the cultural characteristics of modern Japan are defined: a country where cohabit marvelously futuristic instances and ancestral traditions. The new era of Japan will officially begin on May 1st, when Crown Prince Naruhito will ascend to the throne to succeed his father, the current Emperor Akihito.